Bogota Colombia, Vancouver BC- April 28, 2016 - Investorideas.com reports on the recent 13th Andean Congress of Contact Centers and Customer Relationship Management (13 Congreso ANDINO) held in Bogota and a meeting with one of its founders, Ricardo Duran Lizarazo, President of Outsourcing BPO & Contact Center. Following a day at the BPO Congress, Investorideas.com had the opportunity to sit down with one of the industry’s true pioneers, Ricardo Duran Lizarazo, who created the first call center in Bogota. Ricardo had his first client, Hewlett Packard, back in in 1994 and six months later they were followed by Microsoft. Not bad for the start of the first tech support call center in Bogota! Fast forward to today and his company has 1,800 workstations operating in six locations and over 1,700 employees. And listening to Ricardo, his growth story does not end here. He is looking forward into the future of BPO and how technology will play a key role. He shared his ‘secret sauce’ strategy for the next phase of growth but we promised to keep it confidential What became apparent in the interview is that Ricardo has a secret sauce of looking into the future and seeing what is needed and how to get it done. His story of start-up to today evidences he has all the ingredients of success. Ricardo lived in the US for three years and worked for a company that exported to Colombia. He was a purchasing agent and at that time everything was done over the phone. He tells us the phone company service was horrible at the time. But he said it was a real eye-opener to see 800- numbers in the US. That was the future and the opportunity that resulted in the creation of his Company. The way Americans solved everything over the phone inspired him. He was amazed at that the data was available on the call; you name, all your product info etc. When he went back to Colombia he went to work for IT Company. He noticed right away that the end user did not have access to any help or customer support. He saw people carrying in their computers in their hands to get tech support and the light- bulb went on. He knew tech support could be done over the phone and proceeded to convert that idea into reality. It started with a club for all PC users that offered several services including a call center and support on-site. His club was growing but when he had the opportunity to get his first corporate client he changed gears and the Company he owns today was founded. He did it all without any outside funding or investors. It was a creation of insight into the future and innovation from simply paying attention. I think Colombia will more than survive with leaders like Ricardo at the helm. Invest in Bogota is the investment promotion agency for Bogota, a public-private partnership between the Bogota Chamber of Commerce and the City Government. In 2009 we were ranked by the World Bank as the best investment agency of a developing country. Our mission is to support investors who are exploring opportunities in Bogotá. About Investorideas.com - Global news source and newswire covering leading sectors including technology and Latin America. Mark Hillary at 13 Congreso ANDINO in Bogota says “Society is Changing – be Aware! Bogota Colombia, Vancouver BC- April 27, 2016 - Investorideas.com reports on tech analyst Mark Hillary’s presentation at the 13th Andean Congress of Contact Centers and Customer Relationship Management (13 Congreso ANDINO) held in Bogota, Colombia last week. The theme of the BPO Congress was the integration of humans and technology and how companies and individuals need to prepare for the future. As Mark said in his presentation,” Society is changing- be aware.” He was sharing with the companies in the room how they had to prepare for the changing roles of customer service, especially when social media is added to the mix. He talked about corporate and brand myths, such as that brands are like people. He said brands need to create unity in what they are talking about. He also discussed the myth that Millennial's only shop online, noting 82% prefer shopping in-store to online. When evaluating the value of a customer that shops online or in-store he told us that Walmart found the customer that shops both online and in-store is the most valuable of all. “The key is to redefine your business so the customer is at the core of everything “, he said in his closing summary. Meeting with Investorideas.com after his presentation he discussed how social media companies are also transitioning; how Facebook was dominant but is now looking for new sources of revenue and relevance, including news publication and possibly banking. He sees the next step for companies in the social media sector will be virtual reality experiences. You will be able to meet with your Facebook friends in virtual reality. Facebook's $2 billion acquisition deal of Oculus, a virtual reality pioneer seems to point in that direction. Writer, blogger and analyst on issues of technology, globalization and customer experience. Advisor to various governments around the world on technology policy. PhD in Organizational Psychology from London School of Economics (LSE). Directors of the African Outsourcing Association that promotes outsourcing services from Africa. Executive Director of the Brazilian technology research firm "IT Decisions"
Bogota Colombia, Vancouver BC - April 26, 2016 - Investorideas.com reports on the keynote presentation of the recent 13th Andean Congress of Contact Centers and Customer Relationship Management (13 Congreso ANDINO) held in Bogota. Tech visionary Scott Klososky shared his Utopian vision of how technology will change the BPO sector and ultimately all of our lives. “In the future they will look back at this 30 year period and say this was an important, historical time”, he told an attentive audience. He went on to say, “In the next 20 years 35% of all jobs humans do will disappear to technology.” So what will humans do? That was a key question and the concept of ‘humalogy’ was discussed by several presenters at the Congress; the integration of humans and technology. When looking at the role of customer service, he said things are shifting from the H (human) to the T (technology) side. “It is critical for you to have a vision of where technology is going”, he pointed out. Bogota’s BPO sector seems to be paying attention, transitioning from BPO to KPO and ITO and integrating robotics, voice biometrics, digitalization and key technology into the customer service equation. Scott looked back in time with the audience remembering when customer service was just a phone and a human, then looked forward to 2026 when he predicts most of the problem solving will be done by technology and less by humans. He makes a point to say that the human element needs to remain in the customer service sector and the companies that don’t see the value of it are missing the mark. In an exclusive interview after his presentation, Scott shares insight with Investorideas on how individuals/investors can become more educated and prepared for the future and up their tech IQ. When asked if any global government leaders are getting it right in terms of preparing their county for a technology future, he notes that Malaysia and South Korea are doing a good job but he is disappointed in the US. He also talks about how rather than look at this technology driven future as dark and post -apocalyptic we should see it as a Utopian possibility and he is hoping to spread that message globally in future talks. Scott Klososky: Startup founder of successful technology companies such as Critical Tecnology and Webcasts.com that today belong to iBEAM. At 26 he founded with Gary Kasparov, among others, Paragraph Inc, there designed the software to recognize handwritten text for Apple Newton. Visionary consultant and expert on how the technology is changing the world. Founder of Crowdscribed.com. Bogota Colombia, Vancouver BC – April 25, 2016 - Investorideas.com reports on the recent 13th Andean Congress of Contact Centers and Customer Relationship Management (13 Congreso ANDINO) held in Bogota on April 19th to the 21st, 2016 and a snapshot of one of the Bogota-based companies in the sector. The Andean CC and BPO Congress is a meeting place for the best service companies and suppliers of the latest technology with a view to promoting, representing and protecting their interests. This year’s theme and focus was the integration of technology to the human element of BPO; ‘humalogy’. Speakers including well-known technology consultant and startup founder of several companies, Scott Klososky, stressed that as robotics and digitalization will improve costs and make the BPO sector more efficient, there is still room for human contact to resolve problems in the process. The Congress, Invest in Bogota and the companies that opened their offices for tours to show how the sector is thriving in Bogota, all agreed that Bogota has a talent pool of young workers that are a key to the current success and future growth. Bogota, Colombia is fast becoming a destination for tech companies in need of BPO, KPO and ITO. In fact “the number of companies participating in the sector has more than tripled in the last ten years“, says Felipe Rojas from Invest in Bogota. Bogota is the leader in Colombia for the sector with 63% of BPO and KPO located there. Medellin is second with 22% and overall Bogota accounts for 50% of the employment in the sector. Companies like Unisys, AIG and Convergys are capitalizing on the young, eager and educated talent pool that awaits opportunity in Bogota. Convergys has been in Bogota for five years now. Walking into the modern office building, you see a wall of fame showcase waiting to be filled with devoted employees. Several young people were filling out applications as we entered the office for an overview of their operations. They tell us in the meeting they started with one office and now have two in Bogota, so business is growing. The operations here are leaders in bilingual agents. The Company says there is a pool of bilingual talent and one of the ways they find it and attract it, is with social media like Facebook, with all ads in English. Having the ad campaign in English is a first level indication of bilingual talent, followed by online tests in the interview process, in-depth interviews and then training for 30-60 days. Convergys has hired over 900 bilingual employees this year in Bogota. And how do they keep them? Convergys has created a young, hip and fun working place that includes a rooftop terrace looking over the city to have lunch, ‘So You Think You Have Talent’ contests with great prizes and also rewards employees with incentives to refer other recruits, with prizes ranging from sunglasses right up to a motorcycle. The takeaway from the Congress and the meetings is that Bogota is on the radar for tech companies looking for dedicated, young support staff that not only do the job well - but are happy doing it. Convergys delivers consistent, quality customer experiences in 58 languages and from more than 150 locations around the globe. We partner with our clients to improve customer loyalty, reduce costs, and generate revenue through an extensive portfolio of capabilities, including customer care, analytics, technical support, collections, home agent, and end-to-end selling. We are committed to delighting our clients and their customers, delivering value to our shareholders, and creating opportunities for our talented, caring employees, 130,000-strong in 31 countries around the world. Visit www.convergys.com to learn more about us. In 2009 we were ranked by the World Bank as the best investment agency of a developing country. Our mission is to support investors who are exploring opportunities in Bogota. Mesa, AZ, April 15, 2016 – Dog and pet lovers have a new book to add to their collection with the release of ‘A Dog’s Tale as Told by Lakota’. The true story, told from Lakota’s perspective, will make you laugh, cry and ponder her wisdom. Graham Van Zant, who shares her story, tells the journey of a destined rescue and the creation of a family of kindred spirits. Lakota, a malamute/Australian shepherd cross, tells readers how her experience with humans went from good to bad several times before she ended up in her forever home with Graham and Donna. In her most terrifying moment she experienced a gun-shot wound. In her best times she travels with Graham and Donna across North America and discovers Buffalo, meets new four legged friends and an extended family that fall in love with her as well. LONDON, UK, April 13, 2016 - Mark Roberts Motion Control, the award-winning manufacturer of cutting-edge solutions for motion control and broadcast robotics, celebrate their 50th anniversary this year! MRMC designs, manufactures and assembles motion control rigs which have been used in hundreds of major blockbuster movies – Avengers, Skyfall, X-Men and Harry Potter to name but a few – as well as thousands of commercials. The company also creates pan-tilt and multi-axis robotic heads and controllers along with tracking technologies for multiple industries –Television, sports, security and surveillance. MRMC’s client list includes Boeing, Space-X, Sony, Nikon, Harris and many other blue chip companies. 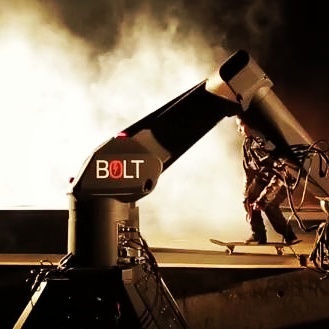 Bolt CineBot – the fastest , high-speed camera robot in the world! The robotics company had its humble beginnings 50 years ago, when in 1966, Australian born engineer, inventor and part time racing driver Mark Roberts set up a company servicing early rostrum camera systems, many of which were mostly manually controlled. He found that by using very early computers (analogue, then later digital) he could automate much of the process of using an animation stand and dramatically increase its speed and ease of use. He also developed new and better mechanics, which revolutionised the use of rostrums/animation stands, especially in TV stations – most of the major European TV stations ended up with Mark Roberts. In 1977, with the release of Star Wars, the techniques of using motion control for special effects came to the world’s attention. From that point onward, Mark Roberts Film Services as it was then known, created better, larger and faster bespoke motion control rigs. The company later changed its name to the current Mark Roberts Motion Control (MRMC), as it diversified in to other types of robotics – investing heavily in research of different types of automated image acquisition. MRMCs engineering prowess earned them an Academy Award for their Milo system. First built nearly 25 years ago, to date, not a single rig has ever been decommissioned. MRMC will be starting their 50th anniversary celebrations at NAB, showing off its latest high-speed Cinebot arm together with new computer vision automation and wireless robotic solutions. There will also be some celebratory giveaways, so make sure you ask for your free 50th anniversary pocket ninja! A New Zealand study published in Bio Medical Central Oral Health last month shows dental health improved the greatest extent for children in non-fluoridated areas. There is now no difference in dental decay rates between non-Maori children who live in fluoridated areas and non-Maori children who live in non-fluoridated areas, proving that fluoridation is not needed for children to obtain good dental health. There has been an improvement in child dental health over the past ten years right across New Zealand. Maori children living in all areas had poorer dental health than non-Maori children (both fluoridated and non-fluoridated areas). This research shows that fluoridation has not closed the health disparity gap. If health authorities are serious about helping Maori children achieve the same outcomes as non-Maori, they need to look at what is different about the two groups, rather than clinging to a public health policy that they themselves have proved is not the answer. According to the Ministry of Health, 40% of New Zealand children have some form of dental fluorosis. This permanent damage is the first outward sign of fluoride poisoning. Now with this latest research proving that fluoridation is not needed, it is obviously unjustifiable to continue fluoridation. Instead, we need to take serious, immediate action to reduce fluoride exposure, as Auckland council has just done last week. The easiest way to do this is to stop fluoridation immediately completely, across New Zealand. POINT ROBERTS, Washington, Delta BC – April 7, 2016- Investorideas.com releases its first episode of Wine Down Wednesday featuring an interview with entrepreneurial movie producer and businessman Chad A. Verdi of Rhode Island. Joining him in the conversation is writer, director, actor Tommy DeNucci, who last year became President and CEO of Chad’s Woodhaven Production Company. Wine Down Wednesday is a new business and financial video YouTube channel created by Investorideas.com featuring experts and CEO’s in leading sectors sharing insight and ideas over a glass of wine. “We wanted to create something new for our listeners that was more like a typical first business meeting over lunch or with a drink. Since most investors don't get to meet a CEO or financial expert in that relaxed informal environment, we thought this would be a great way to invite them in”, said Investorideas.com head of business development. Tom talks about a movie Chad and his team collaborated on and Chad also invested in called Almost Mercy and how that film took him to this next step as President and CEO of Woodhaven. He said he is excited to go the next level with future films. Knowing first-hand what it takes to make quality films, Chad also excitedly talks about a recent article naming his films, Bleed for This and Silence as two of ten movies with Oscar nomination potential for the coming year. Verdi Productions is a fully-funded film production company located in East Greenwich, Rhode Island, with additional satellite offices in Edgartown, Massachusetts, New York City and LA. The company pursues all aspects of filmmaking - carrying projects from concept through postproduction.